In this part of the universe. We’ll go speak to the Friend together. For that is your greatest witness to Him. It’s hard to believe that I made it thirteen days before I introduced a poem by Hafiz, the masterful, 14th century Persian poet and Sufi mystic. I knew once I started I would never want to stop. Thirty days of Hafiz would be a pleasure for me. Hafiz can make me laugh and cry, feel totally understood and totally bewildered, but never, never bored. The Gift, a collection of his poetry translated by Daniel Ladinsky, is my frequent companion. It sits on my bedside table and goes on just about every trip I do, dog-eared, penciled, highlighted, and full of mementoes from various locations. Hafiz’s mystical playfulness resonates deeply with me; I am always looking for a way to joy, to fun and laughter, to companionship with the people around me and with God. I love how Hafiz refers to God as “Beloved” and “Friend, “and calls his readers by those names as well. We’re all in this together his poems seem to say. In this poem, I love how Hafiz portrays himself as an ancient real estate broker, looking out for a special client who has fallen upon hard times. (Who among us hasn’t?) “Fear” has become their habitat and Hafiz can’t bear to see it and is confident God will feel likewise. We cannot “witness” when we are in fear, rather only when “love and playfulness” radiate from our eyes. Can we trust Hafiz to get us relocated? I think so; after all, our souls once played footsie in the “Beloved’s womb.” Having just seen pictures of a friend’s newborn baby, I can honestly say, I believe that’s exactly where she came from. Something that might be missed in a quick reading of the poem is the line that Hafiz delivers, almost sotto voce, a little secret about prayer: “If you/ Pray/ Somewhere in this world –/ Something good will happen.” In these little lines, in the middle of this little poem, he upends everything we’ve been taught about prayer and at the same time, redeems it. From our very first moments, we are taught petitionary prayer, to ask for things, or for things to happen. Inevitably, we are disappointed when they don’t, but what if our prayers were answered, somewhere and for someone? What if the energy, intention, love, devotion and faithfulness we put into our prayers enter the Divine womb to heal and help in ways we never know about? That’s what my friend, Hafiz, does so well: offer encouragement, wisdom, compassion and love, each and every time. Yesterday was a day for writing love letters, which was convenient, since today is Valentine’s Day. But I don’t mean I was writing obligatory cards. Rather, my heart was just full – full of love and gratitude for a bunch of people in my life. Some of them probably expected to get a card from me, but I imagine at least a half dozen didn’t. I hadn’t written to them before and I don’t know if I will again, but this year, for some reason, I just thought, “I Love them,” so I went ahead and did it. I think it’s because of the big Love I’m feeling these days for my youngest daughter Molly Grace. In about a week’s time, she will be having surgery to treat scoliosis with a procedure called “spinal tethering.” It’s a couple days in the hospital, followed by a couple weeks at home, followed by a couple months in a back brace. Though it was a difficult decision, we are confident it’s the right plan and that we have the right doctor. Still, as the date approaches, a low-grade anxiety is permeating our home. And when that happens, whenever Fear appears, I try to double down on Love. I don’t remember where I got the card, but I’m glad I kept it. It surfaces every once in a while, seemingly just when I need to be reminded of the Love I need to give or receive myself. In this case, it’s both. I need to help Molly feel ultimately protected, and safe “in the hollow” of my arms, but I also need to trust that I am being held in the same way. We cannot offer to others what we do not have ourselves. So each morning, as I sit in Centering Prayer, I return my attention over and over again to Love, the ultimate source of my existence. I get up knowing that it is the ultimate action I can take, however it manifests itself that day. Fear does not get to have the final word. Next week, when I watch my girl go into surgery, I know I will be afraid. Fear will be sitting in the waiting room with me, making small talk with Tim and pacing the halls. But I also know we offered ourselves the antidote to that fear when we named her fifteen years ago: Molly Grace. Outpouring Love. Undeserved forgiveness. Divine presence and strength. Inner beauty. Today, Love in a way that is easy and light, but tomorrow, try to Love into a place that has been dominated by fear. You don’t know where it will take you, but I promise it will be better than where you are. Molly Grace and I at her final water polo game last week. I can’t believe that what took only one day for Liz Gilbert and Rob Bell to unpack at a creativity conference has taken me two months to write about. Call it laziness; call it summer vacation; call it what you will, but we are in the home stretch! First we had COURAGE; then there was ENCHANTMENT. We were tasked with PERSISTENCE, before we received PERMISSION. And the fifth word is TRUST. TRUST is hard to come by these days. The world doesn’t seem like a trustworthy place. Presidential politics and police brutality, terrorism and terrible news dominate our airwaves. If you’re paying attention to the outside world, it seems there is little we can place our TRUST in. But according to LG and RB, there is one thing you can TRUST, today and always. You can “TRUST that your life is always talking to you,” but not in that masochistic, “Everything-happens-for-a-reason” kind of way. Absolutely not, but what they would argue is that everything that happens is saying something to you. That something might be really loud and clear, or it might be a whisper you have to listen closely for. It might not even be obvious right off the bat. It might take ten days, or even ten years before you smack yourself on the head like someone in the V-8 commercial and finally get the message. But you know what? If you look back over the last ten, twenty, or forty years of your life, it has probably been giving you the same message all along. I know that’s true for me. Throughout our lives, we keep asking the same questions and our lives keep giving us the same answers, albeit in different ways. The problem is that we aren’t listening; we don’t TRUST our lives, as much as we TRUST the louder voices – those of media and culture and the ads on TV. Let’s be clear though, even if we TRUST that the Universe is talking to us, we cannot expect that nothing bad will ever happen, because it will! We will fail; the people we love will get sick; we might lose everything. The Universe is not a particularly safe place, but what I do TRUST is that my life means something and that humanity is going somewhere. We may have evolved physically from primates, but we are evolving consciously, intellectually, emotionally and spiritually from that place too! It is a slow and painful process, but it is “in process.” On this day, Rob Bell claimed, and I have to agree, that the Christ mystery affirms that there is an animating force that holds the universe together and is always evolving towards greater wholeness. If we TRUST in that, the rest of the pieces fall into place more easily. Can your life TRUST you to listen, or are you like a grumpy old man, turning up the TV set to tune out his wife of fifty years? Can your hands be ENTRUSTED with your life’s work? That’s the crux of the matter and the topic of the next letter LG asked us to write. Our ENCHANTMENT may have shut up, or shut down, because it was tired of being ignored. Who keeps talking when no one is listening? (That’s a rhetorical question by the way. We all know someone!) So, LG asked us to write a letter to our ENCHANTMENT, promising that it could TRUST us. You can TRUST me. I read the letter you wrote to me and you’re right! We do our best work together and I promise to do my best to not let FEAR come between us, even FEAR disguised as “good decision-making.” The people in my life, the ones I Love and trust the most, affirm me when I am open to and working with you. You, ENCHANTMENT, Mystery, Holy Spirit, bring me to life, make me whole and give me all I have to offer the world. “Enchanted Ali,” we have some hard work ahead of us to do, but I will try to make sure I am doing it with you. I will let the chips fall where they may. If I am rejected or fail, I will get still and silent. I will return to you, that which brings me Love, energy and joy, the greatest gifts I have to offer the world. Though I may fail and fall, you can TRUST me to try again. P.S. I will keep pushing my kids towards their ENCHANTMENT too! After we completed our letter and some people shared their responses, LG wanted to give us a final pep talk about what a creative life, partnering with out ENCHANTMENT might cost us and why we should do it any way. Living creatively and curiously – for both men and women – means we look first and foremost to ourselves and the lessons from our own life for guidance. It isn’t about rejecting outside wisdom; it’s about not rejecting our own. How much could we learn from our mistakes and the moments when we got it right? What would our instincts tell us if we actually learned their secret language – the one of sinking guts, tingling palms, and fluttering hearts – instead of pretending we didn’t understand? That’s the kind of TRUST we need to live more boldly and authentically. As I wrote this post, I found myself thinking that it sounded good in theory, but was it actually true? Could my ENCHANTMENT TRUST me to do what I promised in that letter? I started thinking about the times in my life when I have listened to my ENCHANTMENT and we were able to foil the voices of the priests, and principals, and even the loving parents who so frequently dominated my inner dialogue. I think the critical lesson came when I was 19 and found myself pregnant, accidentally of course. I wasn’t in the habit of sleeping around, but it wasn’t with someone I loved either. Culture called for abortion. Catholicism called for adoption. I chose the latter and at first put on the requisite sackcloth of guilt and shame that accompanied my status. “I am a sinner,” I thought, “used goods. The loss of my child is penance for my profligacy with my body.” While I was pregnant, I planned to hide inside, read books, and develop a love for cats (because clearly I was going to be an old spinster with a dozen of them.) I even moved to a “secret location” to avoid pregnancy detection, but here’s the funny thing. Once I was ensconced in a place where no one knew who I was, or how I was supposed to feel, ENCHANTMENT started to work its magic. I forgot to be ashamed of myself. I made friends; I laughed; I went to the beach in a bikini and I met a bunch of guys who worked at a local surf shop. In fact, I FELL IN LOVE with one of them. I was EIGHT MONTHS PREGNANT and I had a new boyfriend! How do you explain that besides MAGIC?!?! To be clear, I wasn’t having the time of my life, but my life took this time to tell me something. Everything was going to be okay – not perfect, not what I had planned – but maybe even better if I TRUSTED my instincts, not my FEAR. I chose Sarah’s parents, people who had careers and a life I had never imagined for myself. But I was drawn by their open-hearted smiles and their obvious Love for each other and to this day our relationship is marked by patience, openness and gratitude. Though it seemed like foolishness to many, I married that boy I fell in love with as a pregnant teenager and we’ve raised three more children together. Out of the 9,000+ days we’ve spent side by side, I’ve maybe only regretted it for five of them (and not even whole days at that). Tierrasanta, the “secret location” I went to run away from my problems, became my hometown. I thought it was a temporary stop, but somehow it became the place I put down roots and raised my family. Love would have the baby. Love would give her up to parents who already Loved and wanted her, before she even existed. Love would fall in Love despite the circumstances. Love would keep on Loving, through the ups and downs, the good times and bad, the richer and poorer, the sickness and health. Love would fall in Love over and over and over again. Love would honor each person for the best of who they are and forgive them for all they are not – or not yet. That’s how I know when it’s my ENCHANTMENT asking the questions and giving me the answers. It always, only, ever wants to Love and then Love some more. FEAR never tells us to Love, though some people get confused. They stay when they should go; they cling when they should release; they suffer in misery and degradation and call that love. That kind of “love” is really just FEAR in the drag of romance and codependency. I think I’m getting the hang of it. I feel a little sheepish to be introducing the third word in this series, PERSISTENCE, after a three-week delay. However, without PERSISTENCE, there would be no #Signs of Love at all, much less this much-delayed post. I love the practicality of this word. According to Rob Bell, PERSISTENCE is the engine of just about everything. Nothing in the world would get done without it. Books wouldn’t get written; companies wouldn’t last; marriages would fall apart. The fact that we exist at all is due to our evolutionary drive to just keep going. A spark might get us started, but without PERSISTENCE, we’d stay right where we are. Of course, we need to find that spark in the first place, that particular something worth our time and effort. Rob Bell introduced the word ikigai, a Japanese word for “that which gets you up in the morning” to describe that impetus. Once we find that passion, or purpose, PERSISTENCE will follow. Sure, setbacks make us want to give up, but when we find ourselves lagging, we can return to that original question. What gets me up in the morning? People give up, because they are pursuing something other than their ikigai, or they don’t what it is yet. It is living out of your purpose, that makes you PERSISTENT. Now, if you are thinking this sounds a little “pie in the sky,” you might be right, which is why it was helpful to have Elizabeth Gilbert there to hit us with the reality stick. For her, PERSISTENCE is a total grind most of the time. That’s why we call it PERSISTENCE! If it were easy, we would call it “Fun!” and we would do it all the time. But things are hard, so we don’t. Each of us has a history of not following through on people and projects. Our lives are littered with unfinished things – personal and professional – and we can carry a lot of shame about those things. But when we beat ourselves up over it, we tend to believe that we are undisciplined losers, who have never persisted in anything in our whole lives, which LG assured her audience was NOT TRUE! So here is my letter from PERSISTENCE. Much like the others, I find it embarrassing and if I didn’t believe in the power of vulnerability, I wouldn’t be sharing it with all of you. I am your PERSISTENCE and this is damn sure what I want you to know about me: I exist! You are fiercely persistent. I may not be bombastic and loud, but I show up every single day! I get you out of bed in the morning to pray, to learn, to stand before God, to make breakfasts and healthy lunches for your family – all before 7:00 am. To kiss and hug your kids, even when they are bugging the crap out of you. You make your family food – you shop and prepare it. You take care of the house and the laundry. You exercise. You raise good kids, the hard way, in ways that no one else sees. You remember other people’s stories, even the details, and you follow up with them to see how they are doing, because it matters to you. You write thank you cards for goodness sake! You read hard books most people haven’t even heard of and then you connect them to your life and try to make them relevant to others. You prioritize your marriage and the romance that sustains it. You willingly choose to hang out with 14 year old girls on Tuesday nights and you do it all with a smile on your face and Love and joy in your heart. You are disciplined enough to know that your own happiness doesn’t mean a damn thing if you can’t contribute to the happiness and wholeness of others. At the time, I felt proud of my list. Today, it feels silly. In part, that’s why it’s taken so long to publish this essay. I was all set to go, then Alton Sterling was killed, then Philando Castile, then the Dallas police officers. I didn’t know what to say. What difference in the world does my own little PERSISTENCE make in the face of a world gone mad? Last week, new waves of terror began: Baghdad, Nice, Germany, and then more violence in our own home: Baton Rouge, Kansas City, Miami. Where will it be tomorrow? What could I possibly say? Through obstacles and distractions, victories and heartaches, PERSISTENCE is the virtue of showing up; it is the ultimate act of “keep on keepin’ on” and it doesn’t get nearly enough credit. That is what I re-learned about PERSISTENCE last week while Tim and the kids and I were at Family Retreat. As I prepared my talk for Thursday morning, I remembered my true ikigai. My purpose on earth (and yours too ultimately) is to Love. Over the course of my lifetime, my ikigai will take a hundred different forms, but currently it means making meals, hanging out with teenagers and writing this blog. And as much as my FEAR and ego like to tell me otherwise, there’s nothing to be ashamed of in that. Thank God PERSISTENCE is there to remind me that I just have to show up and do what I do. The theme for this year’s Family Retreat was “Love is…” and I had asked them to call my talk, “Love is Fearless,” but with everything happening in the world that title didn’t really work for me, because choosing to Love is actually pretty scary and no matter how much we Love, we will still be afraid. The world is a scary place and bad things happen to good people –Loving and kind people. But Love allows us to face our fears and act in spite of them. Love means doing what is necessary to create more wellness, more wholeness, more HOLYNESS for ourselves and those around us – in our own home and in the world. Love is what we were made for and Love is what we are here for. And we know that to create those things – health, wholeness, holiness – we have to show up! Of course, we’re happy to show up for the good things, but we’ve got to stay put for the hard things too – the things we’d rather NOT show up for, the ones that involve pain, disappointment, embarrassment, and hard truths we’d rather lie to ourselves about. There are many things in our lives we’d like to run away from, but that’s not Love, because it lacks PERSISTENCE. On the first day of Family Retreat, I read the passage from 1 Corinthians 13 on Love. Maybe you’ve heard it before? It goes something like this, “Love is patient, love is kind. It does not envy, it does not boast… It always protects, always trusts, always hopes, always perseveres. Love never fails.” If you’ve never read the chapter, dig in, because it is good stuff. The Love that Paul describes is not the wimpy kind of Love we’re used to giving and receiving. This is next-level Love. This Love is MUSCULAR. It is ROBUST. It is HEARTY. It is PERSISTENT. This Love is COURAGEOUS. We need look no further than Jesus on the night before he died to see the COURAGE and PERSISTENCE of Love. Was he afraid in the Garden? Absolutely. He sweated blood. I don’t think any of us has ever been that terrified. And what did he ask of God, the ultimate source of Love he had come from, drawn on and trusted in his whole life? In that moment, Jesus asked for a pass! He was afraid, like you and I would be, and he asked to not have to show up. He said, “If it is your will, let this cup pass from me.” And then what did Jesus do? He showed up! He got up and he walked out – unarmed, and vulnerable – knowing he was going to lose his life, his reputation, his friends – and he trusted in LOVE to see him through it – all the way through the pain and the fear and the trauma of rejection and the hardship that he would face in the following hours. And Love let him walk through it. That’s the part we wish weren’t true. When Love wins, it can still feel like losing. Love doesn’t excuse us from anything, but Love allows us face ALL things – with our heads up, even as our hearts and sometimes our bodies are battered. When we choose to Love as Jesus did, all things can be redeemed. I believe that with all my heart. Thank you, PERSISTENCE, for reminding me what I’m here for. Today, if nothing else, I will show up to Love. No matter where your kids go to school next fall, IT’S GOING TO BE OKAY. But I’ll admit, it’s really easy to forget that. When Keara was figuring out where she would go to school, I had so many hang ups. I was disappointed that we couldn’t afford to send her where she really wanted to go. I felt like I was limiting the potential trajectory of her life by putting parameters on her applications. I felt like a failure as a mom for our financial limitations. I second-guessed every free-thinking decision we had ever made. Maybe some of you will agree with my self-assessment, but Tim didn’t. He reminded me that there is little connection between where you start the fall of your freshman year and where you end up in life! There are no guarantees. I just have to look at my own life to be reminded of that fact. When Keara began the college search process, I wanted to give her exactly what I had – every opportunity – academically, socially, financially – to go to the school she wanted. My parents said, “Pick out a school and go!” so I picked out a great school and I went, but within a year and a half, I was homesick and partying and pregnant. The “best” school simply turned out to be the “best” place for me to learn some really hard lessons about who I was and how I wanted to be in the world. I still finished my degree in four years by attending summer school, intercession and every semester I could, at five different universities. I graduated at 21, was in grad school at 22 and carried on to get my dream job at a local university as an adjunct professor before 25. But you know what? That didn’t turn out to be “the best thing” for me either. Ultimately, I have found the “best” place within myself by integrating my body, mind and soul. I ended up in the “best” place of my life, through trial and error, love and commitment, through facing hard things with all the courage I could muster and the skills I had at the time. I created the “best” place I could by surrounding myself with people I could trust and striving to be that for them as well. My “best” place continues to be wherever I find myself fully engaged in meaningful work, surrounded by people I care about. Friends, this isn’t just my story. It’s your story too. Look at the life you’ve created! Your college experience was a part of it, but only one part. You might have great memories of those years, but you probably could have created them at ten different campuses across the country, or even a hundred. They are specific in details, but not content. You might have gone to one school or three. It might have taken you four years or seven. You might have had starts and stops, dramas and things that derailed you for a while. You probably changed course, at least a couple times and IT’S OKAY. That’s life! No life is protected, or perfect. We know that, so let’s be clear with our kids about what we most appreciate about our own lives. It might help them know what to aim for. Aim for wholeness. Aim for goodness. Aim for meaning, purpose and impact. Aim for independence, in the context of loving, healthy relationships. Aim for respect and wisdom. Aim to learn continually and to use that knowledge compassionately and effectively. At 18, our kids are in process – they are figuring out who they are, what they want to do and what they are capable of. We need to let them figure that out and remember that they can and will figure those things out virtually anywhere. What we’ve given them over the last 18 years of their life is a far greater indicator of their future success than the name on their college degree. P.S. Whatever happens next fall, CONGRATULATIONS! You’ve successfully raised decent, well-educated, productive members of society, who have a strong desire to continue their education and contribute the world in a significant way. That is truly good news! P.P. S. Keara ultimately ended up in an excellent program for her major at CSULB, a school about 100 miles away from home. She loves it and has admitted that although she longed to go back east, she doesn’t think she would have lasted for that long that far away from home. Despite my anxiety, it really has turned out even better than OKAY. A couple of you have seen me since I posted my last blog about fear and loathing in the afternoon. You kindly gave me an extra long hug and asked with raised eyebrows how I was doing, an obvious indication that you are fully aware how not fine I was doing a couple days ago. I’m not complaining; compassion is a beautiful thing. But it did make me think that a follow up post might be helpful. I often want to go back and add a post-script to the stories I tell. The lessons are never over, at least not for me. Life is mostly okay right now, sometimes lovely and peaceful and when it’s not, it’s hard and weird… and the scary parts feel like they could break you, but then those parts pass against all odds and then things are mostly okay again, temporarily, until they get hard and weird again and break your heart. It’s not a great system. If I were God’s West Coast rep, I’d come up with something easier, something you could bank on. I read Anne’s words and I smiled, because that is exactly how I feel. One day last week, things were really hard and weird, and I sat and cried because it felt like it was breaking my heart, but by morning, things were okay again and by the weekend, they were really, really lovely. I checked out of reality and went to the beach with my kids for about 7 days straight. We surfed and swam, played with our little primos (cousins) and ate ice cream every day. If I had my own personal dictionary, that would be the definition of lovely and a whole host of synonyms, like bliss, and awesomeness and joy. But school started for Kiko today; the others follow in a week and then I start a new teaching job. (Did I mention that I am going back into the classroom to teach at a university again? That’s a post-script for my blog on vocation I might need to write.) Everyone will be experiencing busyness and stress and the pressure to perform, so I can almost guarantee that after last week’s loveliness, hard and weird are just around the corner. But I want to do what I can to not get to the heartbreak stage too quickly again. And what I am going to feel is this (I know that sounds awkward but thinking does me no good at all. My “thinking” is what gets me in trouble in the first place.) For those 20 or 30 minutes, I am going to feel loved. I am going to be God’s beloved. I am going to forget all the ways I fall short of the idea I have in my head of who I am ‘supposed to be.’ I am going to repeat the mantra I learned from Thich Nhat Hahn, the Buddhist monk and child of God, “Dear One, I am here for you.” I am going to say it for myself; I am going to say it for my children; I am going to say it for my students, my family and friends. If I can bring it to bear in my life, it encompasses all that true Love is – a kind, compassionate, joyful presence that brings freedom, not fear to all who experience it. Now, that’s my plan, but we all know how plans work. We make them and then life breaks them, which was Fear #2 on my list – The Unknown. 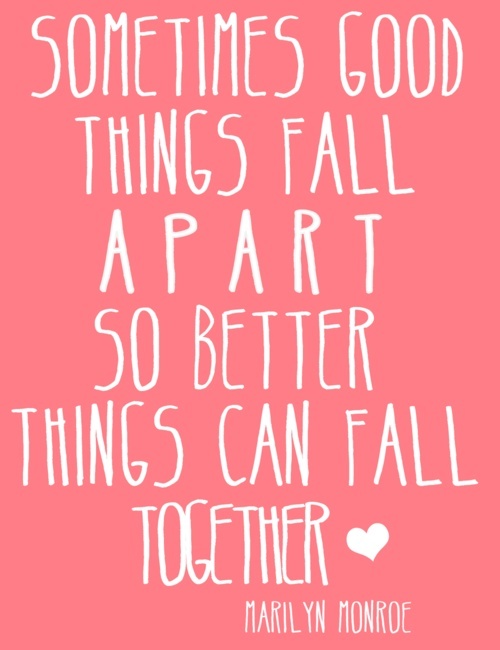 The only thing I really know is that things fall apart, sometimes in big ways and sometimes in small. I can count on the fact that things are going to be hard and weird and then okay and then lovely again. Saint Anne may not think it’s a great system, but I do think it’s something we can bank on. Even just knowing that’s how it works can help a little bit. I also know that the more I can believe in Love, stay in Love, allow myself to experience true Love from the Love that never leaves, the more lovely things will be and that sounds pretty good to me. So to all my readers and friends who are wondering if I’m okay, I am. I am breathing deeply, trying to be present in this moment, fearless and free and in Love. I’ve sat down to write this blog many times over the last weeks. I still don’t know if I’ll get it right, or not, but I thought I’d try again. I’ve been struggling with writer’s block lately. Half-formed ideas haunt me, but the words won’t come. I’ve been hard pressed to complete a single thought, much less string together a series of intelligent ones. There have been saving graces – an episode of Project Runway, the death of a beloved author, a strange request from my husband – but those happy (?) accidents seems to have slowed. Last week I thought I had finally created that perfect writing storm in the midst of my busy summer day: a few hours alone in my cool, quiet house, my work completed, the chores done. There was nothing to distract me. Surely, I would be able to write now. But I couldn’t focus. I fidgeted; I got up and down; I checked email; I about to jump out of my skin. Ultimately, I knew what I needed to do. Despite the 100-degree heat, I went out on a walk to reacquaint my head with my heart and soul. When my head is in charge, there are things my heart finds it impossible to say. By the time, I got to the end of my street, the truth had already bubbled up to the surface and I was able to admit what had been bothering me. In hindsight, it seems obvious, but sometimes it’s difficult to see what’s right in front of us. For the past several months, I have been writing about Love: the power of love, the joy of love, the signs of Love – all the things that keep me going, but what I haven’t written about is the shadow side of Love. I have been trying (with some success) to keep things positive. There is nothing wrong with ‘positivity,’ except when I use it to mask other truths. If “perfect love casts out all fear” as Bono and the Bible like to say, why mess around with anything else? The Love I have been writing about is that perfect Love. If I know that Love, as I have been claiming to, then it shouldn’t leave room for anything else in my life. Except that it does. There is plenty of room for the flip side of love. My fears are still here. I am utterly and completely human, so even perfect Love has to go through my filter. I process it imperfectly and end up with something infinitely less than I began with. Somehow, I fooled myself into believing that this perfect, cosmic Love would leave me fearless. I discovered on my walk that it hasn’t, which is why I found myself sitting at the end of my street in the middle of the afternoon, crying my eyes out. Andy Rooney once said, “A writer’s job is to tell the truth” and as I sat there, I realized that I can’t write, because I’m not telling the truth. I’m telling some of the truth – the truth about Love and what it can do. I’ve been holding something back too – the truth about what happens when Love doesn’t win, because let’s face it, sometimes our humanity simply won’t let it. Bono never mentioned that our fears could cast out that perfect Love as well. I kind of wish he would have warned me. We embrace our fears just as often, if not more so, than we accept the Love that is available to us. It doesn’t mean that Love gives up, or that Love isn’t there. It just means that fear has the upper hand for a while. Fear doesn’t give up either. My life is a dance between Love and fear. Love has been on center-stage and fear wants to have it’s day too. So for the sake of transparency and to get over my writer’s block, I thought I would share some of my fears with you. It’s a short list. I only included three of the biggies. I am afraid of growing old. I am afraid of the unknown. I am afraid of failing God in some critical way. More like Aaaahhh! What did I just do? I thought I would feel better, laying them all out there, but I don’t, not really. Unlike Love, fear doesn’t bring freedom. Basking in fear diminishes us and the possibilities for our lives, but maybe you already knew that. 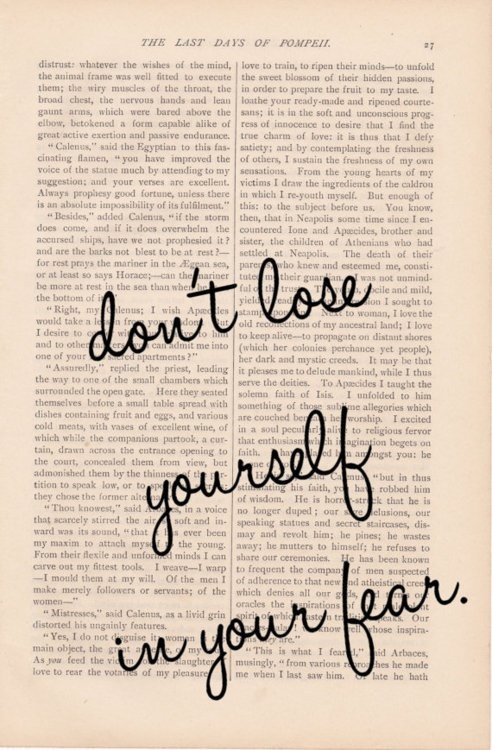 Deep down, I know it too, but sometimes fear just gets the upper hand. What would you do if you were in Love and it made you fearless? I don’t think I can answer that question today. Fear is hogging the dance floor. However, Love is waiting patiently in the wings. She knows her turn will come again soon and I know she will leave me breathless with beauty and wonder. Personally, I can’t wait for our song to come on. Fear is not my favorite partner. If you recall from my post “The Big 4-0,” I decided to give up worrying for 40 days and believe it or not, it has gone well, really well. Almost, I was tempted to think, too well. But never fear, that nirvana came to an end, thank goodness. There’s no humor in “too well,” and no growth either. 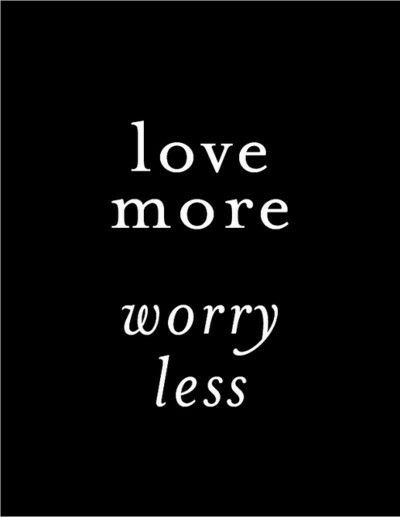 A couple of times over the last few weeks, I found myself thinking, “Why aren’t you worrying about that?” The “that” in question could be anything from a big presentation, to a deadline at work, the Lad’s lost basketball game, or an encounter with a cranky teen. Normally, these are things I would worry about: “How am I doing? How did I do? How did they do? Why are they doing that? What should I do about it?” Honestly, these are the thoughts that can dominate my mind on a stressful day. But I had been enjoying my worry-free state. However, the other morning I woke at 4:30 am, with a familiar ringing in my ear. No, it wasn’t a phone call. It wasn’t my alarm clock, or the smoke detector. It was simply a voice I had been avoiding. It was the siren call of worry and no matter how deeply I buried my head in my pillow, no matter how many times I tossed and turned, no matter how many deep breaths I took, worry had a hold of me. The details are inconsequential, but thankfully, I had a new perspective to manage it. The first thing I did differently was not worry about how I was failing in my quest to not worry. I forgave myself for having these emotions and for not being able to talk myself out of them. That may not sound like much, but it’s a huge first step for a struggling perfectionist like myself. The second thing I did was resign myself to being awake at 4:30 am. I knew that staying in bed was a recipe for more worry. Instead, I decided that distraction was an appropriate alternative, so I caught up on the latest Project Runway episode. (So long, Jerrell!) And when the dawn finally brightened the night sky around 5:30 am, I went on a walk. Over the last few weeks, any time worry looms on the horizon my technique has been to visualize myself in the river of Love. Worrying, I stand on the shore, fighting with the Universe to make things go my way. When I am in the river of Love, I am surrounded by a rush of water, of current, of the inevitability of things. I become aware of my stance, my posture. I lean into Love and watch it sweep away the barnacles of worry that cling to me. So on this early morning walk, I thought about Love and what a powerful antidote it can be to worry and how I wished that I could remember to love and to be in love more. I started singing a line from one of my favorite U2 songs that “Perfect love drives out all fear.” (I know that Bono is quoting scripture, but it sounds so much cooler when he says it.) While I walked, I saw a yellow leaf on the ground and I had to take a second look. 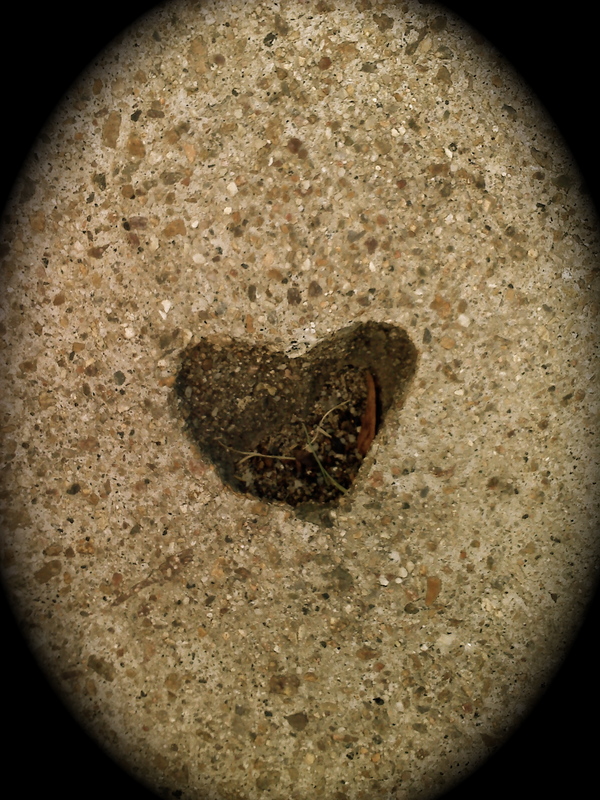 It was a heart, sort of, from a certain angle and I found myself thinking, “Wow, you almost had me there, Universe. Almost, but not quite. Nice try.” I kept walking, wishing I had seen a sign of Love as concrete as the sidewalks I was treading. And then it happened. Looking down at my feet, I saw it. A real sign. A real heart. The Universe was going to get me after all. If I disdained the first message of Love I was given, as not being perfect enough (Ugh! That is so not my favorite part of myself), Love would try again. I still had to be paying attention, but there it was, Love at my feet, written in stone. I stopped. I sat. I laughed and then I cried. I must have looked like a lunatic, but I got the message loud and clear. Love is here. Love wants me. Love is as present to me as my worry is, if I will but open my eyes and see. And now that I’ve seen it once, I’ve begun to see it everywhere. I see it in leaves and trees and rocks and sand. I see it in shells and dirt and even in places I hate, like the dimples on my thighs. Apparently, it was here all along. What is worry, but fear with lots of scary details? And if I trust Bono, and I usually do, then I will keep seeking my entry point into that river of perfect Love that casts out all fear.